iOS 5.1.1 完美破解 (Untethered Jailbreak) 教學經已發佈! 詳情請按此處查閱. 上周, Gizzomo 已發佈適用於使用 A4 處理器的 iOS 主機, 包括 iPhone 3Gs/ 4; iPad (1); iPod Touch 3G/ 4G 的 iOS 5.1.1 破解教學; 使用舊版本 Redsn0w 0.9.10 Beta 8b 率先實現破解, 但程序較為複雜. 今天, iPhone Dev-Team 已更新 Redsn0w, 並發佈 0.9.11 Beta 4 版本; 支援破解運行 iOS 5.1.1 的 A4 主機 (iPhone 3Gs/ 4; iPad (1); iPod Touch 3G/ 4G). Redsn0w 是次的更新, 修服了前版本的錯誤, 並提高了系統穩定性. 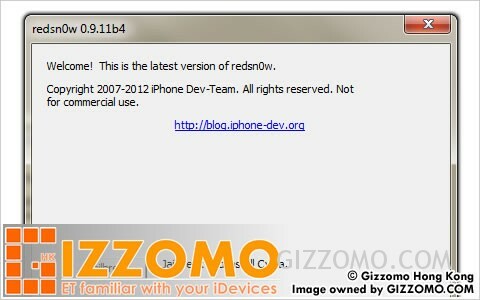 Gizzomo 已同時更新了使用 A4 處理器的 iOS 主機 (iPhone 3Gs/ 4; iPad (1); iPod Touch 3G/ 4G) iOS 5.1.1 破解教學, 有關教學可按此查看; 所有教學發佈前已使用實機作出測試. 想每天緊貼更多 iOS 新聞資訊的話, 立即前往 Gizzomo 香港 Facebook 專頁內按 「讚好!」; 或者 「Follow!」 Gizzomo 香港 Twitter 專頁; iOS 相關的最新最熱消息動態, 就離不開你的手了! Copyright © 2012 Gizzomo.com. All rights reserved. 轉載必須附上本文之網址. Gizzomo 香港新聞資訊平台內之所有文章, 除了特別註明外, 均為 Gizzomo 團隊之文章作品. 本平台內的所有文章, 均表達作者/ 編輯之見解; 並不代表 worldZh Group 甚或 Gizzomo 的立場. iOS 6.1 版本開放下載 ‧ 附官方下載鏈結 ‧ 立即下載! iOS 6.0.1 更新版本開放下載 ‧ 附官方下載鏈結 ‧ 立即下載! News System from WordPress; Content Layout base on Arras. Operated by worldZh Group. Copyright © 2012 Gizzomo.Com. All rights reserved.